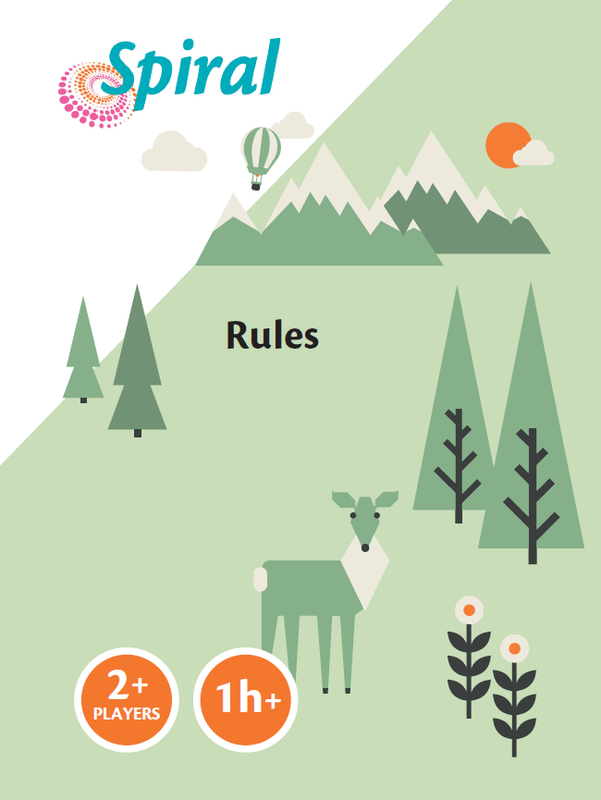 Rules, game board and berry markers are the same for each target group. Each target group has own question cards and reply forms. Materials can be printed in colors on strong paper. 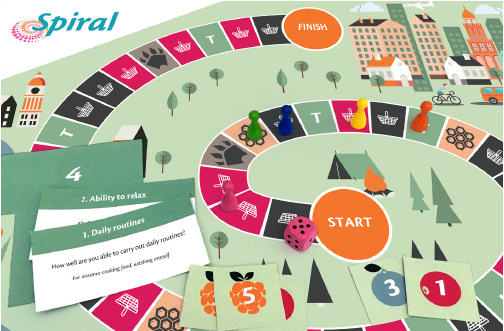 SPIRAL is a board game first developed by Finnish rehabilitation counsellor Kirsi Niittymäki in order to increase client-centeredness in rehabilitation goal-setting among psychiatric patients. Now this practical tool is available for health care professionals working with either psychiatric adult clients or young neuropsychiatric clients. SPIRAL board game is based on International Classification of Functioning, Disability and Health (ICF). It consists of a game board and 24 question cards based on ICF domains. During the game each participant reads a question card aloud and then decides if the area is problematic to them or not. The answers are written down to a personal assessment form according to a scale from ”no problems at all” to ”severe problems”. The rehabilitation goals are formulated based on the answers given by the participant during the game. SPIRAL board game appears to facilitate goal setting in mental health and neuropsychiatric rehabilitation. Usability of the SPIRAL board game has been investigated at several rehabilitation courses for adults with mental health problems and psychosocial rehabilitation courses for adolescents with autism spectrum disorders. According to our experiences within clinical groups, SPIRAL board game can help the participants to recognize their strengths and limitations, increase their active participation in rehabilitation goal-setting and enhance the formulation of individually relevant and meaningful goals. In addition, SPIRAL may have a favorable effect on experienced health and emotional wellbeing in adults’ mental health rehabilitation. Health care professionals have been very interested in this new and user-friendly tool. The method is free of charge and available for everyone on this website. SPIRAL-board game was developed in ”Future in the Game” project (2014–2016) coordinated by Rehabilitation Foundation, Finland. Other partners were The Mannerheim League for Child Welfare, Foundation for the Rehabilitation of Children and Young People and Lempäälä psychiatric outpatient clinic. The development project was financed by The Social Insurance institution of Finland (Kela). ”The SPIRAL game for new target groups” is the result of a development project implemented in 2017–2018 which expanded the range of contexts in which the SPIRAL board game can be used. Development of the game was supported by the Social Insurance Institution of Finland (Kela) and carried out in cooperation with the Rehabilitation Foundation, the Finnish Brain Association, Finla Occupational Health, and the Foundation for the Rehabilitation of Children and Young People (Mannerheim League for Child Welfare). The project was a further step in making the SPIRAL method, which has been found to be useful, more widely applicable by rehabilitation professionals, and helping to spread the word about the ICF frame of reference and increasing its utility as a practical tool. It produced SPIRAL game content that can be used when working with adults undergoing mental health rehabilitation, young persons on the autistic spectrum or groups with language problems (adults, children and families), as well as during vocational rehabilitation.